"This is a really good recipe I came up with while trying to create some tasty low-carb, low-fat meals. This one made my family enjoy eating their veggies for once, and it is so easy!" 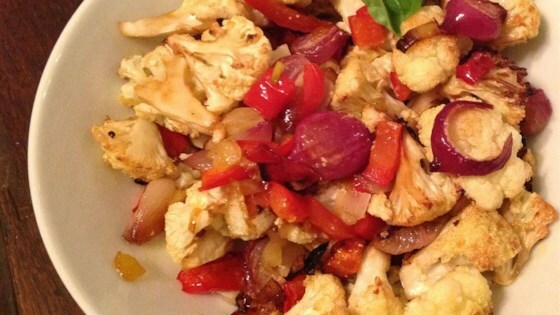 Combine the cauliflower, bell pepper, onion, dill, balsamic vinegar, white wine vinegar, and olive oil in a large resalable bag; shake bag to evenly coat. Allow to marinate in refrigerator 1 to 2 hours, turning bag occasionally. Open the bag and season with salt and pepper; reseal the bag and shake again to coat. Pour into a 9x13 glass baking dish. Bake in the preheated oven until tender, about 30 minutes, stirring occasionally. This recipe is a great idea, but in my opinion, there is too much vinegar. My husband thought it was "OK," so I think that the idea is good, but the vinegar should be reduced. Great way to change your side dish. You can season it a littler more (adding cumin, cilantro or fresh basil), but I really loved the idea. Kudos! Outstanding! Based on one of the reviews I added basil. Otherwise no change. Enjoyed it very much. It was different - not sure that I'd make it a second time however. Excellent! I'm not fond of dill so I substituted oregano. Otherwise followed the recipe exactly. I enjoyed this vegetable dish.